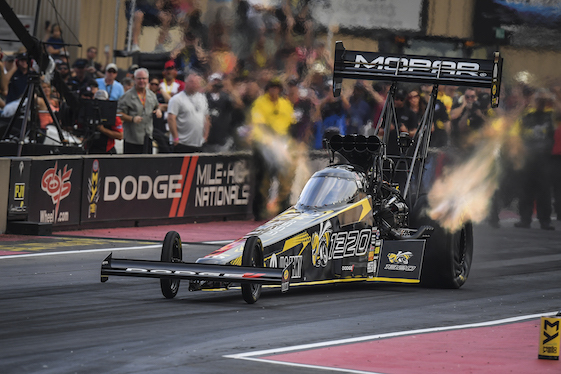 Leah Pritchett will be begin Mile High eliminations from the pole on Sunday. Courtney Force (Funny Car), Deric Kramer (Pro Stock), and Eddie Krawiec (Pro Stock Motorcycle) are also No. 1 qualifiers and will begin the NHRA’s three-event Western Swing from pole positions. Pritchett earned her second consecutive No. 1 with a run of 3.799-secondsat 327.19 mph. This is her 10th career No. 1, she has one win this season, one runner-up finish and is fourth in points. She was the No. 1 qualifier at this event last season and raced to a runner-up finish. Courtney Force was able to improve on her qualifying from Friday night and earned her ninth No. 1 of the season in her final pass of the evening with a run of 3.949 at 309.91 in her Chevrolet Camaro. She is the currents points leader and will face Terry Haddock in the first round. Kramer, a resident of Sterling, Colo., earned his first No. 1 qualifying position at his home track with his pass of 6.929 at 197.57 during the final qualifying session. This is his third No. 1 of the season, his last coming in Topeka where he parlayed it to his first national event victory. He will square off against Alan Prusiensky in eliminations. Top Fuel — 1. Leah Pritchett, 3.799 seconds, 327.19 mph vs. 16. Terry Totten, 4.449, 216.13; 2. Brittany Force, 3.808, 321.50 vs. 15. Jim Maroney, 4.295, 261.88; 3. Steve Torrence, 3.811, 325.45 vs. 14. Bill Litton, 4.283, 218.65; 4. Clay Millican, 3.814, 326.71 vs. 13. Greg Carrillo, 4.129, 307.65; 5. Richie Crampton, 3.822, 318.09 vs. 12. Terry McMillen, 3.995, 301.67; 6. Blake Alexander, 3.834, 326.32 vs. 11. Mike Salinas, 3.865, 272.12; 7. Tony Schumacher, 3.834, 325.37 vs. 10. Doug Kalitta, 3.862, 310.91; 8. Antron Brown, 3.856, 318.47 vs. 9. Scott Palmer, 3.860, 317.27. Funny Car — 1. Courtney Force, Chevy Camaro, 3.949, 322.73 vs. 16. Terry Haddock, Toyota Solara, 4.466, 278.46; 2. Jack Beckman, Dodge Charger, 3.973, 316.67 vs. 15. Todd Simpson, Charger, 4.462, 270.81; 3. Robert Hight, Camaro, 3.986, 321.58 vs. 14. Jeff Diehl, Toyota Camry, 4.287, 272.50; 4. Cruz Pedregon, Camry, 3.992, 318.32 vs. 13. Jonnie Lindberg, Ford Mustang, 4.197, 302.08; 5. John Force, Camaro, 3.993, 322.27 vs. 12. Matt Hagan, Charger, 4.093, 310.55; 6. Tommy Johnson Jr., Charger, 4.003, 312.42 vs. 11. Bob Tasca III, Mustang, 4.087, 306.74; 7. Ron Capps, Charger, 4.007, 320.81 vs. 10. J.R. Todd, Camry, 4.083, 305.01; 8. Shawn Langdon, Camry, 4.048, 316.15 vs. 9. Tim Wilkerson, Mustang, 4.056, 293.41. Did Not Qualify: 17. Jim Campbell, 5.271, 149.07. Pro Stock — 1. Deric Kramer, Chevy Camaro, 6.929, 197.68 vs. 16. Alan Prusiensky, Dodge Dart, 20.336, 65.35; 2. Greg Anderson, Camaro, 6.930, 197.19 vs. 15. Joey Grose, Camaro, 10.066, 94.07; 3. Tanner Gray, Camaro, 6.932, 197.10 vs. 14. Will Hatcher, Dart, 7.142, 191.87; 4. Jason Line, Camaro, 6.937, 198.12 vs. 13. Matt Hartford, Camaro, 6.978, 196.99; 5. Alex Laughlin, Camaro, 6.937, 196.90 vs. 12. Fernando Cuadra, Camaro, 6.971, 196.93; 6. Drew Skillman, Camaro, 6.942, 197.57 vs. 11. Jeg Coughlin, Camaro, 6.962, 197.16; 7. Vincent Nobile, Camaro, 6.943, 197.13 vs. 10. Bo Butner, Camaro, 6.957, 196.82; 8. Erica Enders, Camaro, 6.950, 196.96 vs. 9. Chris McGaha, Camaro, 6.953, 196.67. Pro Stock Motorcycle — 1. Eddie Krawiec, Harley-Davidson, 7.111, 187.81 vs. 16. Karen Stoffer, Suzuki, 7.310, 182.11; 2. Hector Arana Jr, Buell, 7.135, 188.86 vs. 15. Ryan Oehler, Buell, 7.306, 183.57; 3. Andrew Hines, Harley-Davidson, 7.146, 188.04 vs. 14. Joey Gladstone, Suzuki, 7.288, 182.45; 4. Matt Smith, Victory, 7.158, 185.54 vs. 13. Jim Underdahl, Suzuki, 7.261, 182.95; 5. Hector Arana, Buell, 7.207, 185.77 vs. 12. Jerry Savoie, Suzuki, 7.259, 183.05; 6. Scotty Pollacheck, Suzuki, 7.220, 183.87 vs. 11. Angie Smith, Buell, 7.243, 181.69; 7. LE Tonglet, Suzuki, 7.230, 184.95 vs. 10. Angelle Sampey, Buell, 7.243, 185.46; 8. Cory Reed, Buell, 7.230, 184.60 vs. 9. Steve Johnson, Suzuki, 7.234, 185.61. Did Not Qualify: 17. Kelly Clontz, 7.382, 180.69.